Those of you that know me have noticed the transformation I have achieved in just over a year. Those of you who do not, trust me, it has been life changing! This all started last April with a routine physical. I have always hated going to the doctor and had put it off for a long time. I am just over six feet tall and during most of my adult life, weighed anywhere from 200 lbs to a whopping 237 lbs some 20 years ago. Being tall and athletic, I could carry the weight and perform pretty well but it was starting to take its toll on my body. Teaching golf full time requires me to be on my feet, move and demonstrate techniques all day long. It can be pretty tough when the weather is hot and humid. So when I saw the doctor last April, I weighed in at 216 lbs with slightly high blood pressure and an elevated cholesterol number of 248. I also had plantar fasciitis, pain in my shoulder, elbow, lower back and hamstrings. I was a physical mess and knew I could not continue to teach golf and compete in golf tournaments effectively if I continued in this direction. This is the old me about 40 pounds ago! Improve my general health, cholesterol, blood pressure, etc. 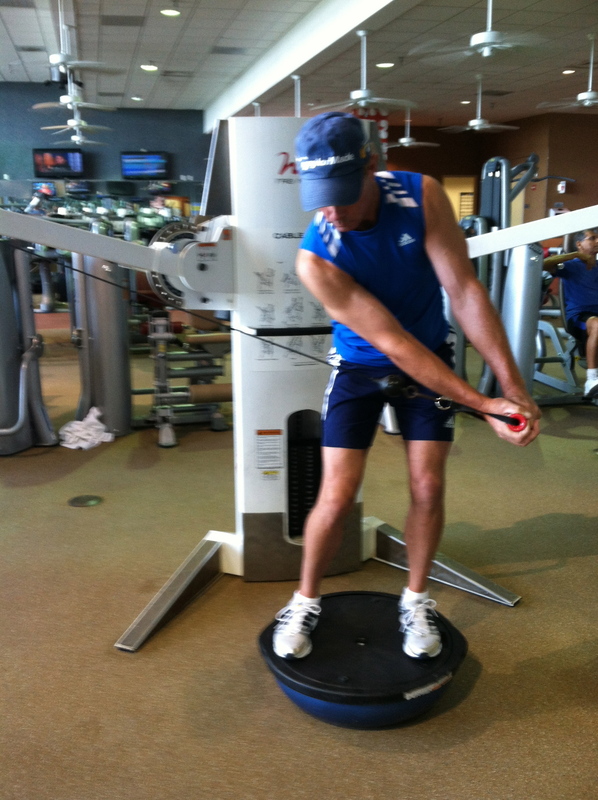 Improve my golf fitness to play better. So, I started my own program to improve. I belong to the Sport and Health Club and have been a member for maybe 10 years or so. I had always done some working out during the off season but now I was much more committed. I decided to set aside time to workout even during the busiest part of my season which I was now entering. With limited time to workout, I started swimming laps in the evening after work. This helped me to beat work burnout and help cool off after a hot day on the lesson tee. By July, I was down to 200 lbs and feeling better but knew I had a long way to go. My golf game was not up to my standards and still painful to swing, particularly in my back and shoulder. Later in August, I got sick and lost 5 or 10 more pounds not by design. I went to the doctor and the good news was that my blood pressure was back to normal and the cholesterol was down to 200 which is the number doctors recommend you stay below. I then set a new goal to take my fitness to the next level and hire a trainer. I have known many trainers over the years and I am certified as a golf fitness trainer from Dr. Greg Rose, now with the Titleist Performance Institute. I really did not want to go to a golf fitness trainer since I knew what they did already. My plan was to choose someone who would listen to my needs and be flexible with my program. I also wanted a trainer who was not full of ego and obsessed with power. And, I wanted training to be fun and not drudgery! I went about my workouts at the gym and started observing the trainers to see how they interacted with their clients and if they were having fun while working out. All of the trainers at Sport and Health club are excellent I believe but one stood out to me. Her name is Sunny Hamidi and we started working together last Fall. I chose her mainly because of her personality, the fun her clients were having and her perfect posture (which I really wanted to improve on). And, she was running a special and had some golf knowledge too! I must admit my initial evaluation was depressing. I could not do much of a deep squat or some basic mobility tests and my flexibility and balance were pretty bad. We started slowly and steadily made progress. Sunny introduced a lot of variety in the sessions which kept it fun and not boring. Before I started with Sunny, my own routine was just that, too routine and I was not making further progress, maybe called the “plateau effect”. 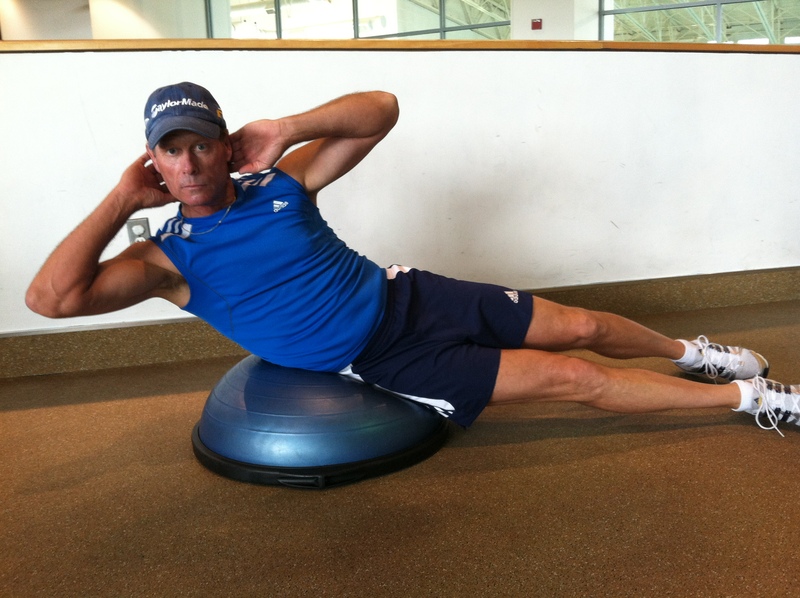 Core strength is so important for Golf! Our training program involves less use of the weight machines and more techniques using my own weight and constant variety in the routine. In a few months, my weight was down to 190 and I was feeling less pain. The weight kept coming down to a point that it concerned me because I did not know where I would end up. What was happening we suspected was that my new energy level had become so high and my metabolism was burning calories at a much higher rate, even at rest. I was entering uncharted territory for me with these new energy levels and weight loss! Well, I bottomed out at 176 lbs and now am back to my new “normal” at 178 lbs! Needless to say, I feel great! Waist size is now 32 inches which is down from 36. Golf shirt size is now a large instead of XL. I had to buy a lot of new clothes but that has been a pleasure! The fitness progress has been consistent and remarkable! My strength, balance and flexibility currently are way better than I ever thought was possible. TRX is tough! But it works! One of my big concerns was that losing so much weight would reduce the distance that I would hit the golf ball. Well, that has not been the case, in fact, I have gained more distance and club head speed. Having the ability to rotate my body better, along with a much stronger core and swinging pain free have been the big reasons for the added club head speed. 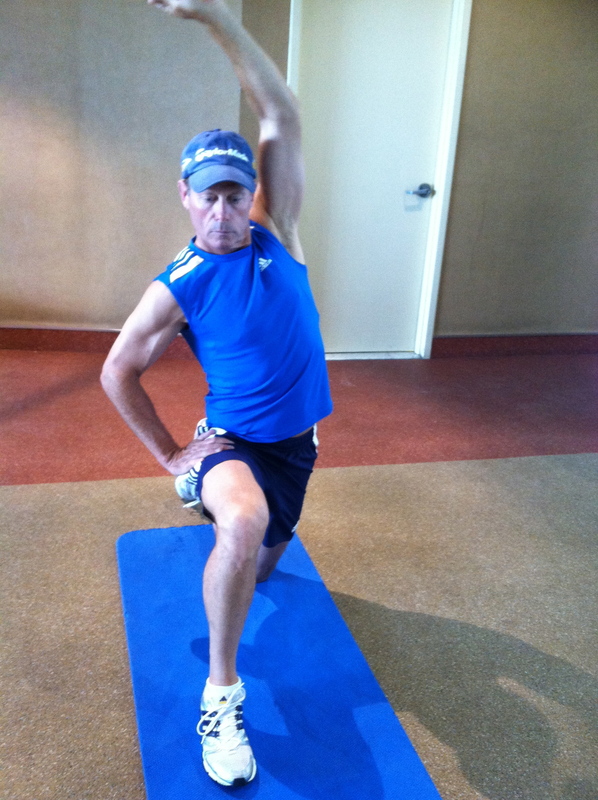 This really helps my balance and stability at impact with a golf shot! Sunny has kept me motivated to improve in other areas of health such as my diet which had been pretty bad even while losing the weight. I have to say that I lost a lot of weight without changing the diet much. I was maybe just eating less and burning more through exercise. I am eating better now since adding in more fruits and veggies to my diet. Sunny has been very flexible with my goal setting and we are now into the golf season. We have altered our training so it does not interfere with tournament play by over training my arms and upper body. Our new goals now include more work on diet, posture, flexibility and keeping the core and lower body strong. The rotation in my golf swing is so much better now! Speaking of tournament play, I have really improved my ball striking thanks to Sunny’s work. I can now move my body the way I want which is exciting! 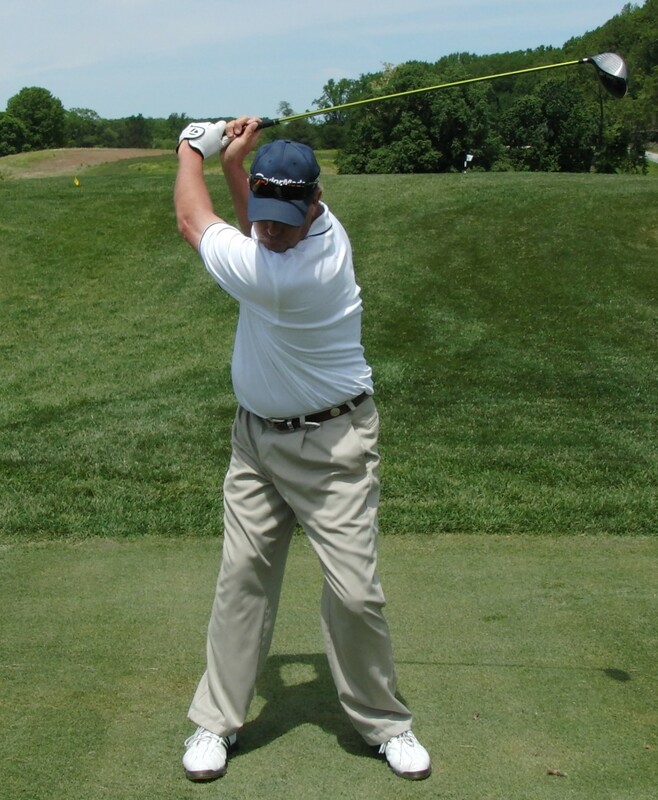 There is nothing more frustrating in golf then to know how to swing (which I do) and your body not permitting it. I have always been tight but my flexibility is improving dramatically! I do not get to compete in many tournaments but still enjoy the competition. Recently, I qualified for the Maryland State Open Golf Championship which will be held later in July. What was nice about qualifying was the energy level I had after walking a very hilly course for 18 holes. I was not even tired like I would have been before! My power has been good and striking pretty clean so now I just need to focus more on putting. 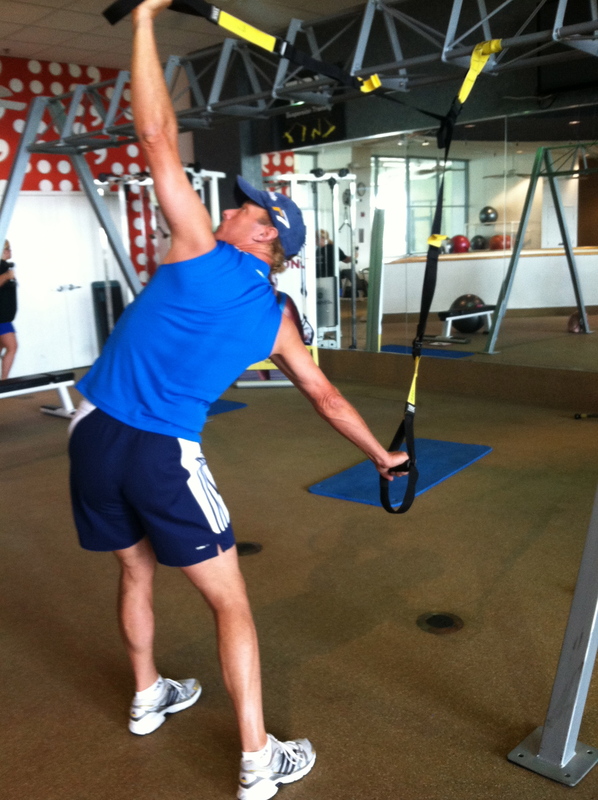 The bottom line is that golf has become fun again because of my new fitness level!! This one is very hard as you move back and forth like a “saw” while holding posture! As a teacher, I can tell when a student has not practiced between our lessons. I did not want to be one of those “students” who does not “practice” while training with a professional fitness trainer like Sunny. So, I do the extra training on my own and actually find it fun! Having a coach is important, it gives you someone to be accountable to and someone to help you reach levels you would never reach on your own. Working with Sunny has been the best decision I have ever made regarding my health! Life changing really! I would highly recommend Sunny if you are in need of a versatile fitness coach! Thanks for sharing such an inspirational story of your progress. Thanks for sharing this Fran. It inspires me to do more. I have also been working with a wonderful trainer, kevin scanlon. I have lost more than 25 pounds. I have a long way to go but i feel much better. Happy to hear that Mr. Oppenheimer! Keep up the good work! Thanks Larry! You are looking pretty fit yourself!